The triaxial probe holder with custom bends and optional piviot mount, (stright version shown on American Probe & Technologies LP600 micropositioner). The probe mounting pin jack can be ordered in your choise of 45 or 60 degree angle. This veriety of mount offers stronger mechanical holding of a straight probe than the 74J series that requires pre-bend probes, that could rotate within the in-line/ low profile probe mounting. The assembly comes complete with an intergrated mini low noise traixial cable terminated into a standard three lug triaxial BNC connector. Please specify the cable length desired, the price noted is for a length of up to 1 meter. The probe pin jack is designed for a 20 mil probe shank. 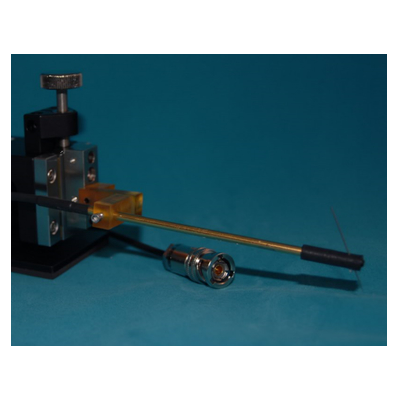 There is a wide veriety of mounting options and available probe holder lengths. This series is with custom bends, please provide drawing when ordered.